These original GNK design stack rings add bright sparkling color to everyday dressing. Wear it alone or stack them together. They come with all color gemstone combinations. 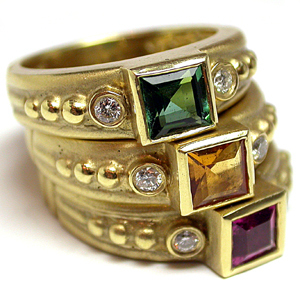 In the center of these individual rings square cut (from top to bottom)green tourmaline, citrine and rhodolite gemstones with two round brilliant cut diamonds (.25 carat,F/G color, SI clarity). All hand-set with perfection in a smooth bezel. The side of the ring has a fancy bead design that tapers to a comfortable shank. Fashionable matte finished rings come with high polished beads and bezels.